Michael Zabarankin, Stan Uryasev, "Statistical Decision Problems: Selected Concepts and Portfolio Safeguard Case Studies"
The third edition of this ground-breaking book continues to advance its mission to support groups to do their best thinking.
? 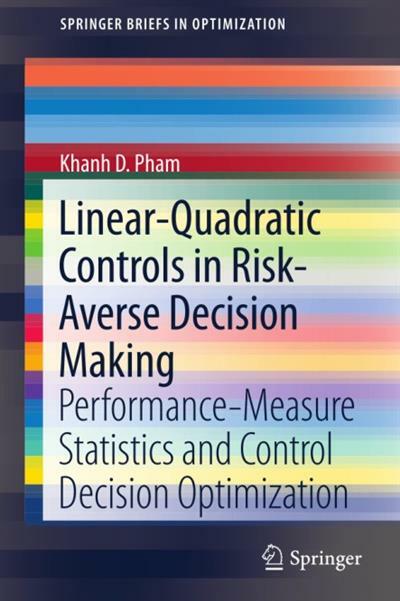 ?Linear-Quadratic Controls in Risk-Averse Decision Making cuts across control engineering (control feedback and decision optimization) and statistics (post-design performance analysis) with a common theme: reliability increase seen from the responsive angle of incorporating and engineering multi-level performance robustness beyond the long-run average performance into control feedback design and decision making and complex dynamic systems from the start.